Bluetooth, Rear View Camera, Air Conditioning, Power Windows, Power Doors! Hot Deal! We've marked this unit down $4300 from its regular price of $42988. Toyota has over 80 years of truck history built directly into the 2016 Tundra. This 2016 Toyota Tundra is for sale today in Mission. The 2016 Toyota Tundra is ready for work or play with its impressive towing capacity and built to last overall quality. From the aggressive grille designs to the bold Tundra badge stamped in the tailgate, this Tundra commands respect. Loading and unloading your cargo is now a breeze thanks to the hydraulically assisted Easy Lower and Lift Tailgate found on all 2016 Tundra's. From the job site, to the commute home, or to the home improvement store on the weekend, the Tundra delivers sure-footed performance with exceptional stability under load. 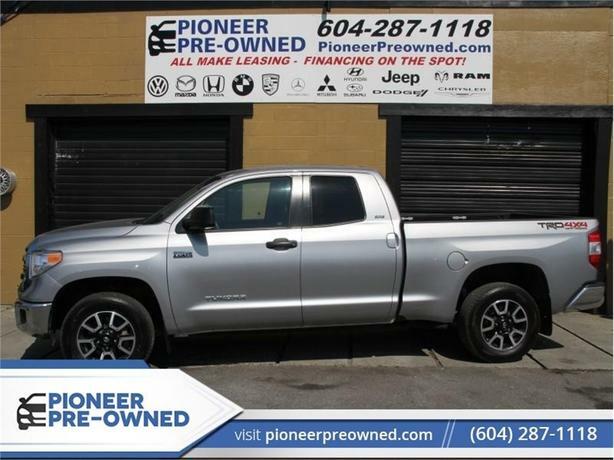 This 2016 Toyota Tundra is truly built to do everything you need! This Double Cab 4X4 pickup has 42523 kms. It's gray in colour. It has a 6 speed auto transmission and is powered by a 381HP 5.7L 8 Cylinder Engine. This vehicle has been upgraded with the following features: Bluetooth, Rear View Camera, Air Conditioning, Power Windows, Power Doors, Soft Door Close. It has some remaining factory warranty for added peace of mind. Our Tundra's trim level is SR. This Tundra SR was built for work and play cranking out 381 horsepower and 401 lb.-ft. of torque. Matched with an huge cargo bed, it'll handle just about anything you throw in it. Standard features include a 6.1 inch display with touchscreen, bluetooth connectivity, air conditioning, 18 inch steel wheels, wireless streaming and even a rear backup camera.